Wild returned to home ice for the final National League game of 2014, meeting third placed Sheffield Senators. 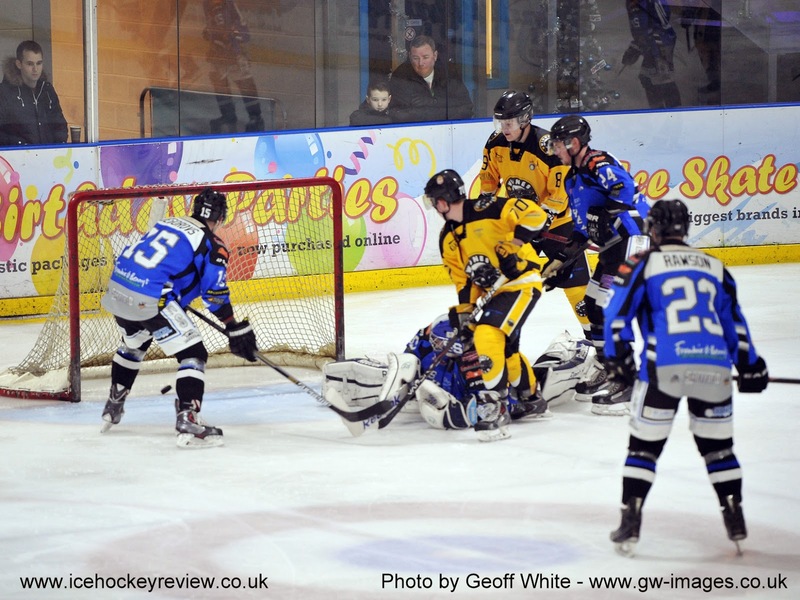 The most recent game between the teams saw the Wild go down by the odd goal at Ice Sheffield. Callum Ruddick returned in defence for Widnes but they were without the injured Dan Bracegirdle, Pavel Vales and Tom Ratcliffe. Young Sheffield Academy players, Josh Benstead and George Crawshaw lined up for Wild. The first period opened with sustained Widnes attack and they took the lead at 2.37 when Tom Revesz's shot was misjudged by Hartley. Wild went further ahead at 5.41 when Joe Greaves worked the puck out of the right corner before firing a low shot into the right corner. Sheffield were playing on the break and they pulled a goal back at 6.34 when a Jegerovs cross ice pass found Callum Rawson. His powerful rising shot beat Greg Ruxton. The Sheffield equaliser came after sustained Widnes pressure. The puck went loose on the edge of the crease, enabling Paul Lofthouse to force it past Ruxton. Wild regained the lead through Bobby Caunce at 17.05 , the forward stretching with his stick to tip the puck past Hartley. The second period opened with an end to end attacking game. Sheffield equalised at 24.07 when Rawsons powerful shot was half saved by Greg Ruxton but trickled into the left corner. Widnes restored their lead at 26.52 when a Widnes shot was saved and Lee Pollitt forced the puck past Hartley. Within a minute, Wild went further ahead, Filip Supa cleverly bringing the puck from behind the net. He wrongfooted the defence and slotted the puck inside the post. This seemed to give Sheffield renewed energy. At 33.47 they came back to 5- 4 when Gent created a chance for Rawson to fire past Ruxton. Turning sharply, he fed Sheffields outstanding forward in front of the net.The Sheffield equaliser came at 37.51 when Wheway skated in front of the defence before backsticking it high past Ruxton. Both sides fought frantically to gain a lead as the period came to a close. The third period had barely started when a Sheffield breakaway saw Nathan Parkes - Britton shoot past Greg Ruxton at 40.23 to give Sheffield a 6- 5 lead. At 43.32 they went further ahead when the puck was worked round the Widnes end before Parkes - Britton fired straight past Ruxton. Widnes swapped netminders with Josh Benstead replacing Greg Ruxton. It was still end to end attack and Widnes came back with a great goal by Joe Greaves. He broke quickly down the left before firing an unstoppable shot into the top left corner from an acute angle. As Wild pressed for a deserved equaliser , Filip Supa took a two minute penalty for cross checking. Sheffield took advantage of a tiring Wild to set up Sergevs Jegerovs to fire high past Josh Benstead for an eighth Senators goal at 58.31. Joe Greaves took the MVP for Widnes after an all action attacking performance. Callum Rawson took the award for Sheffield. Filip Supa was a constant threat, working so effectively behind the goal. This was a game which Wild had every opportunity to win with Sheffield content to hit effectively on the counter attack - their speed on the break causing constant problems for a Widnes defence missing the recovery speed of Pavel Vales. Again Bobby Caunce and Lee Pollitt worked tirelessly to set up their fellow forwards with goalscoring opportunities. With the season at the half way point, Wild are well capable of pushing for the end of season play offs.